Summer camp is coming up in just a couple weeks. Summer camp is a critical time for our youth leaders to put the leadership they’ve been practicing into action. It’s what they’ve been working toward all year and looking forward to. If you are planning to attend summer camp, please keep in mind that this is a time that the boys can manage their own affairs during the week. They are expected to get up on their own at reveille, get themselves ready, assembled and down to the field for morning flags and breakfast on time. They are capable of heading off to merit badge sessions on time and are expected to know where they are (or ask one of the youth leaders for help). They are able to get back in uniform, assembled and down to flags and dinner, then off to special assemblies or evening merit badges. They can do this without adult involvement or interference. It will look a little rocky the first day or two, but by the time they do it themselves a couple times, they’ll fall right in. The patrol leaders have the responsibility to manage their patrols. It’s more important that the boys take ownership of their experience and learn from it than it is that they line up straight or tuck in their uniforms. Adults don’t have to stay isolated from the boys, but you don’t run camp, you don’t set the agenda, and it’s not your responsibility to make sure your son or any other boys get dressed, brush their teeth, get to classes or meals. You’re also not there to take care of your own son – let him learn to take care of himself. Feel free to ask your son, or any other Scout, how it’s going, what they’ve been doing, which badges they’re working on, how big a fish they caught, and so on. But it’s only by boys taking responsibility for themselves and their fellow Scouts that they learn leadership and enjoy an experience in character development unavailable in any other summer camp or youth activity that will help them immensely in the future. You’re not the boss of him, for this week – allow him to learn to be self-sufficient in a safe environment. So what do adults do? You’ll be relaxing a good bit of the time (bring your favorite camp chair and a good book), but there’s also plenty to do. Volunteer to help the camp ranger with a service project or with the Wednesday carnival. Go for a refreshing swim. Try your hand at archery or scale the climbing tower. Enter the Scoutmaster IronMan Challenge. Talk to some of the staff members or camp commissioners or adults from other troops. Visit the trading post and pick up a camp t-shirt or mug. Or just go for a hike – there are miles of hiking trails at camp. Hang out with the other adults. Tell stories. Drink coffee. Enjoy the serenity of the adult back-of-the-woods campsite. If you’re a committee member, there will be boards of review to hear toward the end of the week. The toughest job for any parent is in letting go, especially when it comes to Boy Scout-aged boys. Boy Scouting isn’t a “parent-and-son” experience; it’s a Scout-to-Scout experience. As they say, your mileage may vary. Your summer camp will be different from ours, unless you’re also going to Camp Rotary in Clare, Michigan (celebrating its 88th year of summer camp), but your experience will be similar. And the adult experience should be the same: Stay out of the way and let the boys lead. In almost every troop, however, there’s probably one or two adults who want to see a well-run, efficient program, and in trying to see to that themselves they take away from the boys. Keep an eye out, and gently remind them that the goal is not to get a perfect score on the camp checklist, but that the boys have real responsibility and ownership of their success. The Scoutmaster coaches the youth leaders behind the scenes, not in the middle of the action, and there’s no substitute for planning and preparation. If there’s one thing as Scouters that we can do in the course of the year to support our youth leaders, it’s to let them practice actual leadership for a week at camp. Sure, weekend campouts are a chance to lead, but they’re quick – get in, set up, run camp for a day, pack up and leave. By immersing our boys for a week in an environment where they call the shots on how to meet expectations, we give them a tremendous gift – the gift of self-confidence and the knowledge that they can set goals and accomplish them. This is Scouting’s unique feature. Nearly all other youth programs and summer camps are programmed and run by the adults. Will your boys’ summer experience be like all the others, or will it stand above and apart? It’s up to you! 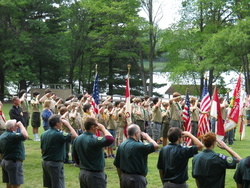 Postscript: Clarke Green had a great article last week on scoutmastercg.com with advice for Scouters from a former camp director on having a great week at camp. It’s worth a read, especially if you’re going.